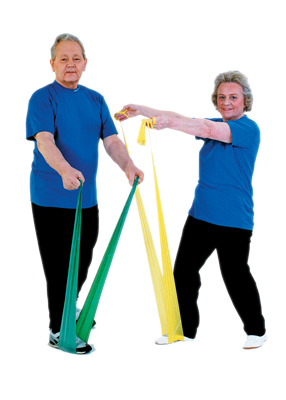 TheraBand® home exercise kits are packaged for resale . These convenient, professional kits are ideal for a wide range of home exercise programs. TheraBand® tubing is made of natural rubber. 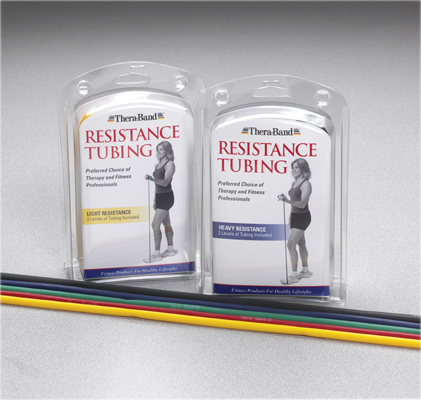 Resistance levels, obtained by varying the thickness of the tubing, are color-coded in proprietary TheraBand® colors increasing in difficulty through seven levels from tan through silver. The color-coding system provides positive reinforcement and feedback for gauging results. Dimensions: 6" x 2" x 5"
TheraBand® latex exercise band can be used independently or as part of a progressive exercise program. Band is 5" wide.